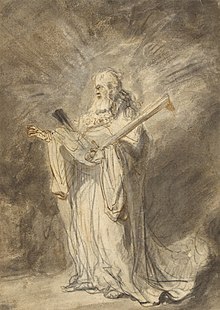 Heavenly host (Hebrew: צבאות‎ sabaoth or tzva'ot, "armies") refers to the army (Luke 2:13) of angels mentioned both in the Hebrew and Christian Bibles, as well as other Jewish and Christian texts. The Bible gives several descriptions of angels in military terms, such as their encampment (Genesis 32:1-2), command structure (Psalms 91:11-12; Matt.13:41; Rev.7:2), and combat (Jdg.5:20; Job 19:12; Rev.12:7). The heavenly host participated in the War in Heaven. Depiction of the Commander of the Lord's Army in Joshua 5, by Ferdinand Bol, 1642. In the Hebrew Bible, the name Yahweh and the title Elohim frequently occur with the word tzevaot or sabaoth ("hosts" or "armies", Hebrew: צבאות) as YHWH Elohe Tzevaot ("YHWH God of Hosts"), Elohe Tzevaot ("God of Hosts"), Adonai YHWH Tzevaot ("Lord YHWH of Hosts") or, most frequently, YHWH Tzevaot ("YHWH of Hosts"). This name is traditionally transliterated in Latin as Sabaoth, a form that will be more familiar to many English readers, as it was used in the King James Version of the Bible. Once when Joshua was near Jericho, he looked up and saw a man standing before him with a drawn sword in his hand. Joshua went to him and said to him, ‘Are you one of us, or one of our adversaries?’ He replied, ‘Neither; but as commander of the army of the Lord I have now come.’ And Joshua fell on his face to the earth and worshiped, and he said to him, ‘What do you command your servant, my Lord?’ The commander of the army of the Lord said to Joshua, ‘Remove the sandals from your feet, for the place where you stand is holy.’ And Joshua did so. In the Book of Revelation, the rebellious forces of Satan are defeated by the Heavenly Host led by Michael the Archangel during the War in Heaven (Rev.12:7-9). The term "Lord of Hosts" is also used in the Bahá'í Faith as a title of God. Bahá'u'lláh, claiming to be the Manifestation of God, wrote tablets to many of the kings and rulers of the world inviting them to recognize Him as the Promised One of all ages and faiths, some of which were compiled and published in English as The Summons of the Lord of Hosts. In the English epic poem Paradise Lost by John Milton, the Archangel Michael commands the army of angels loyal to God against the fallen angels of Satan. Armed with a sword from God's armory, he bests Satan in personal combat, wounding his side.